Holly Korn holds off two defenders. The 6-foot-2 attacker’s size and quick hands have helped her tally 15 goals so far this year. Holly Korn’s collegiate career hadn’t gone as planned. Formerly a highly sought recruit out of the Minneapolis area, she’d barely played during her 2015-16 freshman year at Colgate. She’d transferred to Northwestern, underwhelmed coach Kelly Amonte Hiller in an offseason workout and been denied a spot on the team. The most involved she could be was serving as a team manager, filming practices from the sidelines. But while she filmed, she also took notes. And then, later, she did the drills herself. A year and a half later, the now-junior has started all but two games this season as an attacker and ranks fourth on the No. 7 Wildcats (11-3, 3-0 Big Ten) in goals, with 15. But her big break initially came at a totally different position. In the lead-up to the 2017 season, freshman Julie Krupnick went down with an injury, leaving NU with only one healthy goalkeeper — then-sophomore Mallory Weisse — on the roster. The coaching staff was confounded. “We were just brainstorming like, ‘What are we going to do?’ and then someone said, ‘We should ask Holly to play goalie,’” Amonte Hiller said Thursday, thinking back and laughing about the situation’s absurdity. Assistant coach Tim McCormack offered Korn the new role while she was fittingly packing up the camera one day after practice, Korn said, and her reaction was an instant ‘yes.’ But neither McCormack nor Amonte Hiller — nor anyone else in the program — had any idea just how ready their camerawoman was to see the field. Motivated by her failed tryout the summer before — “I can’t take on another player at that level of fitness,” Amonte Hiller said she told Korn bluntly at the time — Korn said she’d been timing her own runs and comparing them to the scholarship players’ times for months. By the time the goalkeeper job opened, she was right in line with the players she had been filming. As a goalkeeper, the 6-foot-2 Korn saw very limited game action, allowing two goals on three total shots faced. But more importantly, she cemented her role as a capable player on the team and gained insight into the goalkeepers’ perspective, which she said she now applies to her attacking strategies. Krupnick’s return to health this past fall, combined with Korn’s newly developed chemistry with her teammates, finally afforded Korn the opportunity to move back to the attacker position she grew up playing. Amonte Hiller said she immediately noticed the junior making an impact and, after getting over her initial surprise, knew she’d be a weapon entering the spring season. That premonition proved correct. As the Cats head to Pennsylvania to face No. 14 Penn State (9-4, 3-0) in a crucial top-of-the-conference battle Saturday, Korn is red hot — riding a streak of 10 goals over her last six games — and, with her basketball player-like size, is proving a near-impossible matchup for opposing defenses. Korn has excelled offensively this season because of more than simply her size, though. 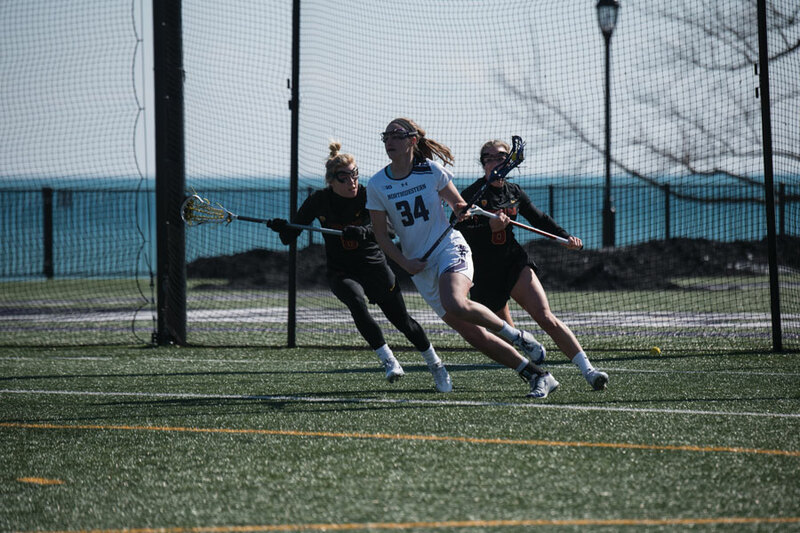 As a dual-sport athlete growing up — doubling in both lacrosse and ice hockey — and as the daughter of a 596-game NHL veteran, Korn has always had adept hands. But until recently, she said she often aimed for the wrong place. Her versatile skill set has led to Korn often looking down at the ball in the back of the net this year. She scored her first Cats goal in the season opener against Canisius, registered her first multi-goal outing March 10 vs. Marquette and has, in recent weeks, become a key factor behind the team’s ongoing six-game win streak. It’s a far different perspective than the one Korn had in her first months in Evanston, when her only view of the net was through a camera lens. And her remarkable journey from one vantage point to the other has affected the whole team, Amonte Hiller said.